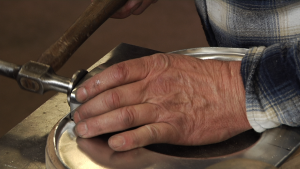 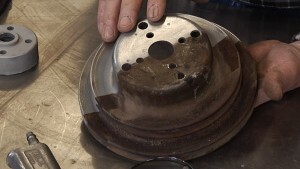 Using basic hammer forming techniques, Mark Simpson transforms two flat pieces of aluminum into a custom air cleaner. 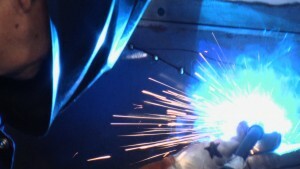 Using this process virtually any sheet metal part can be recreated from patch panels to custom center consoles, their simply are no limits. 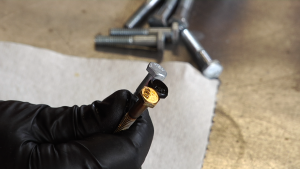 Converting the coating on your bright zinc plated nuts and bolts to a yellow caddium or black oxide look is a lot easier with some great products available from Caswell Inc..
Cars of the 30s through the 50s notoriously had issues sealing out the elements once their seals began to degrade. 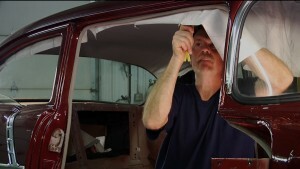 Installing new weather seals will keep the rain and dust out for years to come and can be accomplished in a few short hours in the garage. 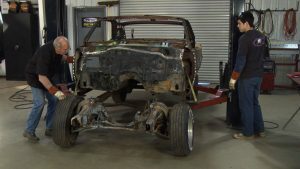 Craig Hopkins throws the 1967 Chevy Chevelle up on a lift and uses a set of rocker bars to remove the body from the chassis. 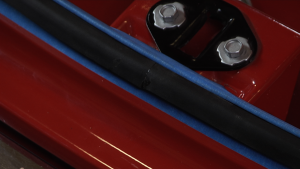 He stresses the importance of checking underneath the body as you’re lifting it off the chassis for any caught brake lines or other impediments.